Product #1772 | SKU 324 | 0.0 (no ratings yet) Thanks for your rating! A 5/8' bushing with a 3/8' female attachment to connect to a tripod. 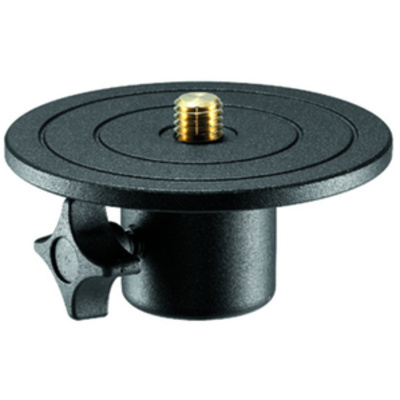 The Manfrotto 324 - Survey Tripod Adapter is made of two pieces: a 5/8' bushing with a 3/8' female attachment to connect it to a tripod and a removable plate 124mm diameter with a 5/8' male thread that should stay connected to the equipment. With the 324 it is possible to transform any Manfrotto tripod into a tripod compatible with the standard attachment interface system used in the survey and measuring industry.